The DomeXF plug-in for Adobe After Effects on Windows (all PC versions 6.5 and higher, including CS5) aids the artist in creating common dome ready transformations and outputting them to pre-produced, distribution-ready video or stills. Each transformation provides the user the ability to add a layer of content onto a backdrop which is then distorted accordingly for the dome. This new plug-in streamlines the powerful video compositing tools of Adobe After Effects. Now With CS5 Windows Compatibility, DomeXF version 2 is built for Adobe After Effects CS5 on Windows PCs (64 bit). Version 2 also adds a grapple function for manipulating images. Users purchasing DomeXF version 2 receive both versions (DomeXF version 1 for pre-CS5 and version 2 for CS5 and higher) for one price. DomeXF utilizes the standard After Effects plug-in structure so there aren’t any awkward windows or controls to work with. Simply make your adjustments by means of sliders and instantly see their effects. Because DomeXF is an After Effects plug-in, the production process is simplified due to the ability to preview footage prior to rendering. Fine tuning and editing of your assets can be done on the fly without rendering test footage. Exporting dome master files for distribution or still frame all-skies has never been easier. 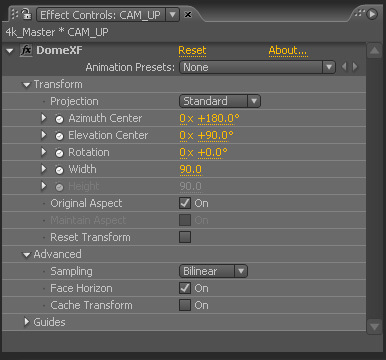 By utilizing DomeXF and exporting frame sequences through After Effects, creating a dome master is now a simple rendering process. The DomeXF plug-in for Adobe After Effects is available from Sky-Skan for $395USD*. DomeXF is sold on a per license (per computer) basis and requires a one-time software activation before its first use after installation. Price is for US customers. For international pricing, contact your local Sky-Skan sales representative.